Overlooking Lake Michigan, UWM has over 27,000 students from 92 countries and is one of America’s top research universities. For anyone looking to improve their English. Join students from more than 20 countries who enroll in the UWM Intensive English Program (IEP) each semester! Choose the IEP to improve your English before beginning full time academic study at UWM or another U.S. college or university, to improve your English for professional advancement, and to achieve your personal goal of gaining greater proficiency in English. For international students admitted to UWM. Are you an international student who has been admitted to UWM for academic study? Depending on your admission type, you may be required to enroll in English for Academic Purposes (EAP) courses. These courses are also open to students who have been fully admitted in an academic program at UWM but wish to continue improving their English language skills. These courses count for credit towards your UWM degree. Find out if EAP is where you need to be! The English Language Academy resides in the University of Wisconsin-Milwaukee community. UWM has a total undergraduate enrollment of about 24,000, and offers more than 200 degree programs. The campus is located on the urban East Side of Milwaukee, close to fun restaurants, shops and parks. It overlooks the neighboring Lake Michigan and is only 1.5 hours away from Chicago. Milwaukee has the world’s largest music festival and many lakefront ethnic festivals. Students can visit museums, theaters, zoo and explore many city attractions. UWM ELA students have many options to get involved on campus, such as recreational sports, free entrance to University Sporting events, interest clubs and campus events. UWM strives to be a place where all feel welcome and supported, invigorated and educated. 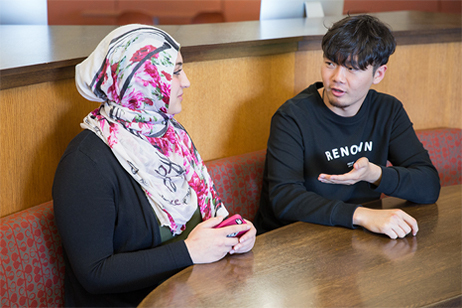 Here in the English Language Academy, we have two separate programs to fit the needs of any student, whether you are looking to improve your English skills or if you are currently a student admitted to UWM looking to fulfill your English language requirement. Need to apply to UW-Milwaukee?